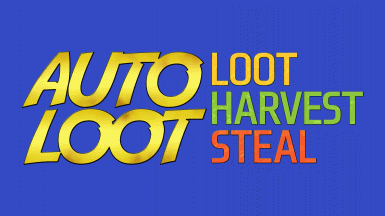 Auto Loot is the first and most configurable auto loot, auto harvest, and auto steal mod for Fallout 4. Auto Loot is the first and most configurable area loot mod for Fallout 4. With Auto Loot, you can automatically loot Ammo, Armor, Bodies, Components, Containers, Drinks, Flora, Food, Junk, Keys, Magazines, Medicine, Valuables (junk with rare components), and Weapons. You can automatically send that loot to any settlement, your inventory, or mix and match. Plus, you can configure all aspects of Auto Loot while in the game using a Pip-Boy holotape. READ THE DOCUMENTATION for more information on configuring Auto Loot. In addition, all Papyrus INI settings must be set to the defaults.